Spring is springing around here. Well, it was until this weekend, anyway. Woke up Saturday to a few snow pellets on the back deck, and this morning it was 28 degrees. Brrr! 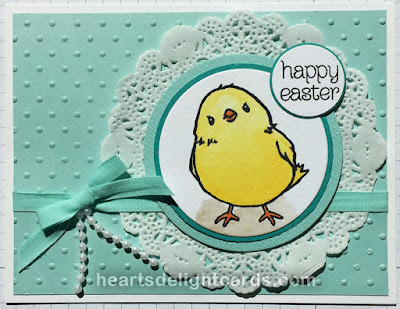 I'm trying to get some spring cleaning done here on the blog, so at the end of this post will be some details on the cards I made for the last Control Freaks blog hop. Meanwhile, here is one of the Easter cards I sent this year. Yes, #imbringingEasterbacktoo, LOL! I just can't get enough of this adorable little chick! Emboss Pool Party rectangle with polka dot folder and adhere doily to right side. Wrap ribbon around and adhere to back side. Fasten mat to card base. 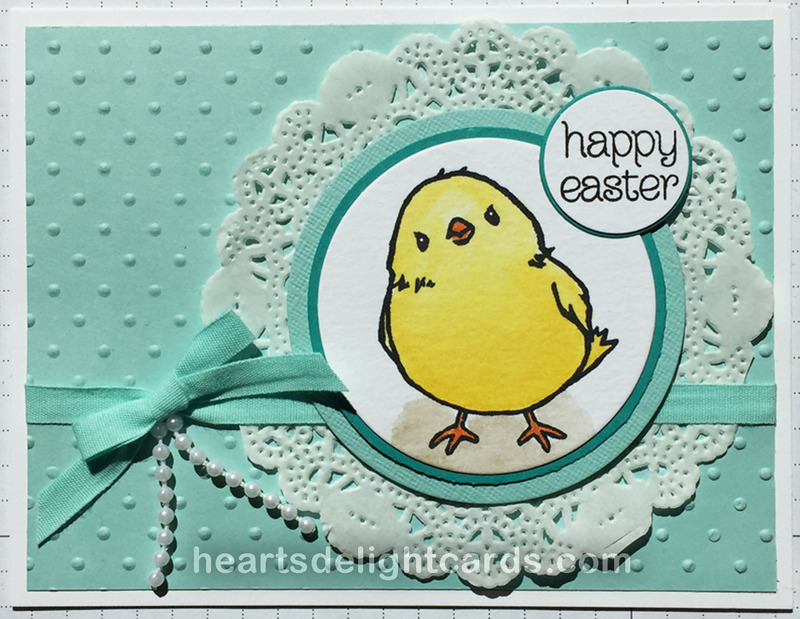 Stamp and color bird, then cut out with Framelit. Mount on Island Indigo circle then Pool Party circle. Fasten matted image over ribbon and doily. Stamp greeting and punch with 1" circle punch. Mat on Pool Party circle and attach to card with Stampin' Dimensionals. Tie a bow and attach to card using Glue Dots. Cut two pieces of pearl string embellishment and adhere just under bow using Fine-Tip Glue Pen. Let dry completely. Loved Receiving this card! Made my day...actually week! Thank you! Sally, I'm so glad it brought you a smile! You just made MY day!!! Fun at the Stamp Club!